Garden design for a small space can be challenging. If not carefully planned, the space can end up cluttered, uninteresting and a poor use of space. The best place to start is to compile a list of your requirements. What do you want featured within the space? How do you plan to use the space? Which materials and colour palette do you like? Your list might include a barbecue or outdoor kitchen, a dining table or somewhere to sit and relax, a water feature, some greenery and garden lighting. After you have established your wish list, the fun part starts- design! For small spaces, the key is not to ‘over design’. Over-designed spaces can look cluttered and make an already small space look even smaller, they can also clash or compete with your home. Start by positioning cooking facilities ideally near or beneath the alfresco to enable close proximity to your kitchen and dining area. This may mean the incorporation of an extractor fan to service your barbecue. The exception are pizza ovens which are best positioned further from the house for smoke reasons. By doing this, they also create a hub to gather around during the cooler nights- a perfect gathering for cooking not only pizzas but a roast or even toasting marshmallows with the kids. Just ensure the oven is positioned so that smoke doesn’t affect your neighbours! Storage for cooking facilities is also important- even a simple cupboard or drawer setup can create storage for cooking utensils and keep benches or tables uncluttered. Next, consider how you will use the space and the type of furniture you will have. Decide whether you want to use the space for dining and entertaining, relaxation or both (if you have space). Outdoor dining settings are best positioned close to your kitchen or barbeque. Relaxation lounges or daybeds can be positioned in a corner of your yard further away from the house to draw you out and create a quiet corner for reading a book or magazine. Built in seating is a great idea for a small space. Some spaces are so small there may be no room for dining or lounge furniture so a built in bench seat, daybed or L-shaped seat to one corner of your yard can maximize space and functionality. 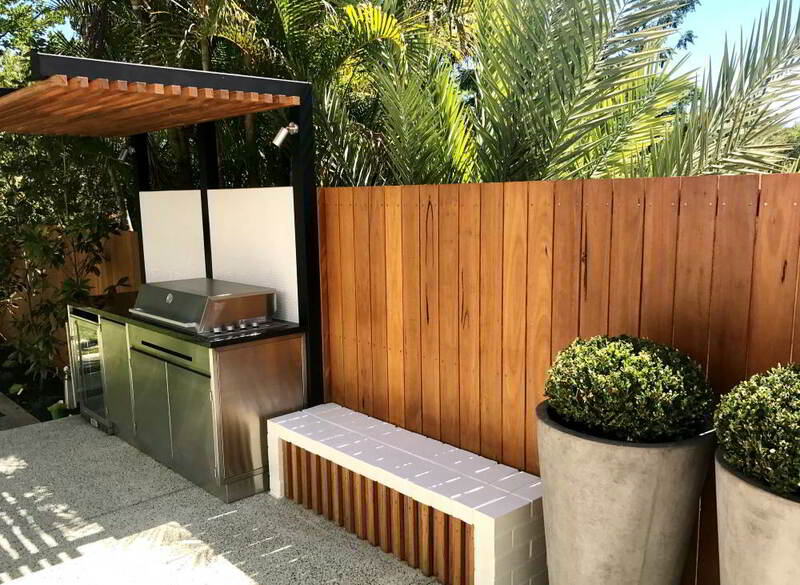 A custom built seat can also be a feature in itself- picture some nice cushions, a Travertine stone top with contrasting Blackbutt battens to the face. When combined with lighting they can create some wow factor for your small space. Flooring and walling is best kept simple. Small spaces always benefit from a simple material palette- choose one material and stick with it. You may choose honed aggregate for flooring which will provide a seamless look and help to open up your space, large format paving around 600x600mm will do the same, or wide board decking ideally in a lighter colour- Blackbutt or Pacific Teak are ideal. Avoid smaller pavers or dark colours as they tend to make a small space look even smaller. Boundary walls or fences are best kept simple as well- white or neutral light coloured rendered walls will provide the illusion of more space and light coloured fences will do the same. Cladding walls or screening fences with a light coloured timber can create a nice feature to be viewed from your home but be careful not to overuse timber as it will have less of an impact if overused. Dark colours can look good in larger spaces but avoid using in a small area. Wall art or a water feature on your boundary can also create a focal point and draw your eyes out. Just be careful when selecting a water feature and choose something that is quiet and has a slow trickle- keep in mind water noise can echo in a small space. Small enclosed areas can often get hot, so consider a shade option during the planning process. Something simple like a shade sail or something more structural such as an extension of your alfresco roof or a freestanding roof structure. Steel or timber posts are a good option, especially if cantilevered off the fence- they will have minimum impact on the rest of the yard. Avoid using brick piers as they will take up too valuable space. Greenery is an important component for any garden and especially a small one. People often think a small space would benefit from no gardens and maximum paving- wrong! 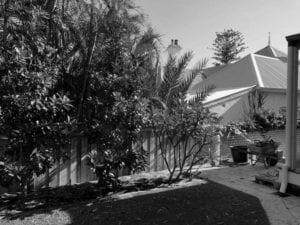 By carefully positioning even the narrowest of gardens 200-300mm wide around the perimeter of your yard, it will enable you to incorporate some narrow planting such as bamboo or even creeping Ficus which will attach itself to your boundary wall. Any type of greenery will help soften your small space and create a vibrant area. Raised planter boxes are also great, not only creating a raised garden but also doubling as seating. Lighting will transform any space but particularly a small one- garden lighting creates a lovely ambience and brings your space to life at night. It creates more of an outdoor room feel by providing definition to the area. Depending on your budget, a small spa can also create a great place to relax year round and will draw you out to your space during the cooler months. 2x2m spas can slot into most small courtyards with ease and offer a great alternative to a pool if you don’t have space for one. Having said that, even pools if carefully designed, can sit against your house if engineered and constructed in conjunction with a new home, maximizing your surrounding space. The key for a small space is in the planning- plan it well and the results will speak for themselves. If you follow these tips, you can’t go wrong!